All nurseries are registered and inspected in line with the Early Years Foundation Stage (EYFS) framework. The EYFS is a frame work for children’s development from birth to the end of their first (Reception) year in our Pre-school. The EYFS helps us set the overall structure for our nurseries but there is no absolute structure that we adhere to. However we do try to break of our nursery into learning Zones. We fully support the unique child at each setting and as such we try not to age relate a room or unit, merely to reflect a child's ability and progression towards their individual learning goal. Baby Unit - from six weeks to two years old. Pre-School (3-4 year olds) & Reception Class 3 - 5 years. Educationally the Early Years Foundation Stage embraces all children up to Year 1 in school. We follow the exact same curriculum as all Nurseries, Pre-Schools and Reception class in schools, the emphasis will be on early literacy, numeracy and the development of personal, social and emotional skills. Presented as seven areas of learning, they provide a foundation for later achievement. We are very experienced with this framework. Since September 2008 we have evolved best practice to meet both the needs of the parent and that of our regulatory body- Ofsted. Toybox Day Nurseries inspections carried out under this framework are evidence that we grasped the concepts set in the framework and capably delivered them to all children. Our history and success in gaining two outstanding inspection reports greatly helped in September 2012 when the new EYFS came into effect. Toybox was proud to be a pilot nursery working closely with Ofsted in early 2012 to evaluate in practice the new framework and new inspection techniques and was delighted with the feedback from the inspector on the day. With the transfer of a number of senior management staff to Toybox Great Denham these experiences has ensured that the new framework is not only understood but delivered in practice. Children develop and learn in different ways and at different rates and all areas of Learning and Development are equally important and inter-connected. However from September 2012 there are now three prime areas and four specific areas of learning. These combined seven areas are one more than old EYFS with the splitting of communication language and literacy. These areas are specifically crucial for igniting children’s curiosity and enthusiasm for learning and for building their capacity to learn, form relationships and thrive. Physical Development - Involves providing opportunities for young children to be active and interactive and to develop their co-ordination, control and movement. Children are helped to understand the importance of physical activity and to make healthy choices in relation to food. Literacy - development involves encouraging children to link sounds and letters and to begin to read and write. 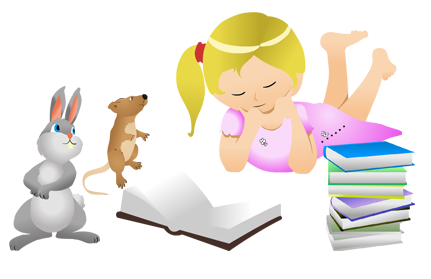 Children are given access to a wide range of reading materials (books, poems and other written materials) to ignite their interest. Mathematics - Involves providing children with opportunities to develop and improve their skills in counting, understanding and using numbers, calculating simple addition and subtraction problems and to describe shape. Expressive Arts and Design- Involves enabling children to explore and play with a wide range of media and materials, as well as providing opportunities and encouragement for sharing their thoughts, ideas and feelings through a variety of activities in art, music, movement, dance, role-play and design and technology.